Real estate properties are some of the most commonly bequeathed gifts. But if you are not careful about how you gift that property, you may create more headaches than anyone wants to deal with. Of course, joint ownership extends beyond properties bequeathed to one’s children. It can also be a group of friends going in together to buy a property, a business group making the purchase, and so on. No matter what the situation, joint ownership can create issues. Consider these concerns before entering into any sort of joint ownership situation, and meet a real estate lawyer to advise you along the way. One of the first issues any joint tenancy situation is likely to run into is how difficult it is to make decisions. Do you want to knock down a wall and open up the kitchen? It may seem like a no-brainer, and will probably boost the property’s value, but you cannot just dive into the project. Just about all changes to the property will require the approval of all owners listed on the title, including refinancing or selling. Is one of the owners estranged from the rest of you? You will probably need the services of a real estate lawyer to mediate. This is an issue many don’t think about, but one that can have major impact. Once an owner has been added to the title, you will need their consent to remove them. This does extend to gifted property as well. If you add your children to a title to ensure it goes to them upon your passing, you will need to get each child’s agreement in the event that you change your mind, no matter what the reason is. At the same time, some joint tenancy options do not restrict what an owner does with their portion; they may sell or transfer their portion without approval from the other owners. Property ownership is considered a financial asset, even if that property is split between multiple owners. What this means in the financial realm is, if one of the owners is experiencing financial trouble, the property is fair game. Creditors can go after the owner’s portion of the property to collect their debts, which can create some legal hoops to jump through for the other owners. As we mentioned above, most decisions pertaining to the property will need approval from all owners. This can get even more complicated if one of the owners is physically or mentally incapacitated in some way. If, for example, an owner has Alzheimer’s or dementia, they may not be able to give their consent. In those instances, the court can provide approval, but it will take time and the assistance of a real estate lawyer. Whether you are thinking about entering into a joint tenancy or you have questions about an existing ownership situation, a real estate lawyer can help you determine the best course of action. 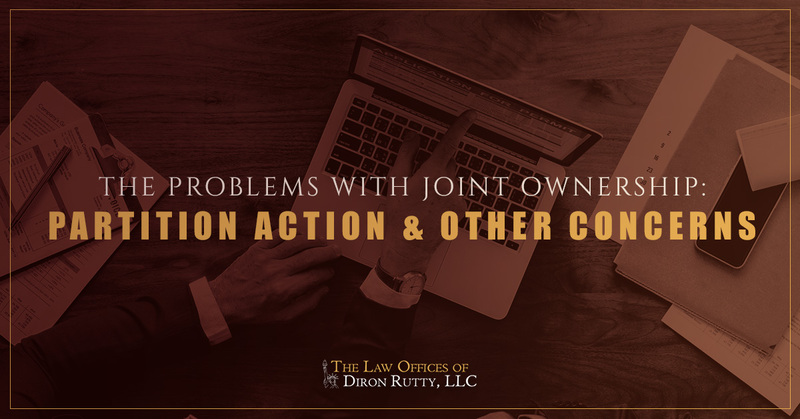 Contact the Law Offices of Diron Rutty for partition action, conveyance, lease agreements, and any other real estate legal concerns in the Bronx and surrounding areas.